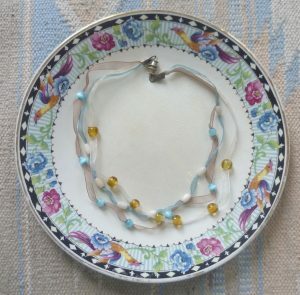 I already had various broken bits of jewellery that I’d inherited – one thing about being the only girl in the family is that your grandmother or great aunts’ old-fashioned beads tend to come to you. 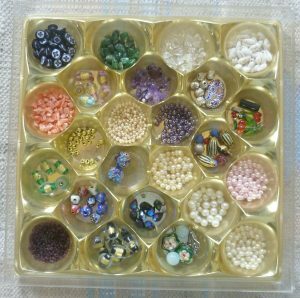 I had a shoe box full of jet beads, single earrings, broken necklaces and a small glass jar full of sparkling cut steel beads. Surely I could do something with them? I made a shopping list of essentials to get me started and went to the Bead Shop in Covent Garden. Luckily, a dear aunt had been involved with Unity Theatre in the Thirties and, amongst her things, I found some tiny pliers, a sharp pair of small scissors and lots of sewing thread – not to mention a wonderful bag of bits and pieces she used when making costumes for the theatre. (It was my aunt who’d left me the steel beads.) 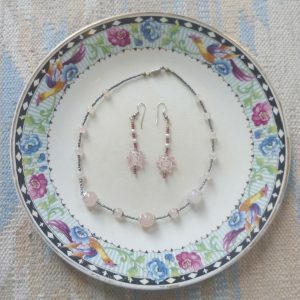 The rose quartz and steel beads set was my first attempt at making jewellery. 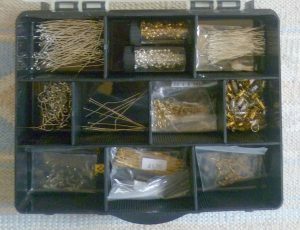 ‘Findings’ is the generic name for all those things you need to finish off the jewellery you make: necklace clasps, earring hooks, head pins for making dangly earrings, and so on. My bead tray is also really useful. It allows you to put the beads in sequence and see what your necklace or earrings will look like before you actually start. You’ll see that I’ve put out six blue and white Chinese beads; three of them have dark blue beads in between and the other three have gold beads which allows me to decide which to go for, blue or gold. 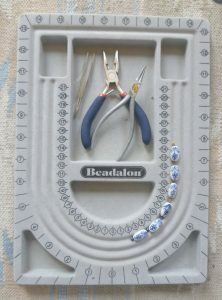 The bead tray is also useful for holding the pliers, tweezers etc. The surface is felted so the beads don’t roll about. Initially, I didn’t buy a proper bead box; I used a Ferrero Rocher box and it works pretty well – and it was no trouble at all to eat the chocolates! You will see that I have a number of semi-precious stone chips: jade, amethyst, garnet, crystal and coral. The Geological Museum (part of the Natural History Museum) used to sell necklaces of small semi-precious stones for only a few quid. I bought a garnet necklace, and a necklace of jade, amethyst and rock crystal, both of which I dismantled. 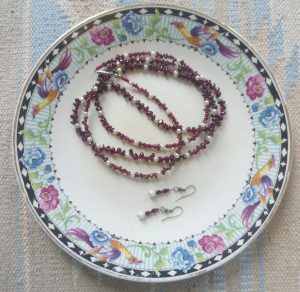 The long necklace and earrings set above was made from the Geological Museum garnet beads. I made it long enough to wind three times round my neck and become a choker, or be a two strand ordinary necklace, or a long 1920s- inspired necklace. I found several ‘statement’ beads in the bits and pieces I had, and I made myself the choker and matching earrings set above using an attractive large black and white Chinese-looking bead. It’s turned out to be a very useful set as it goes with most things. My paternal great-grandmother was a great one for jet beads. She was very much a late-19th century lady when proper mourning observance was part of what one did. So I have a lot of jet jewellery with bits missing. 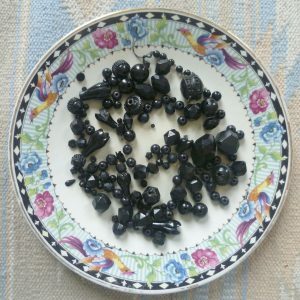 The problem with late Victorian jet beads is that they are brittle and tend to break easily. 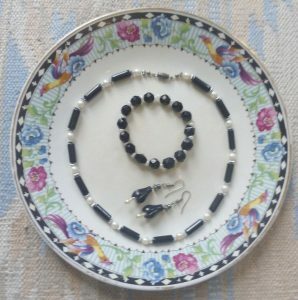 I made myself a ‘jet’ set, but the necklace is black onyx and pearls – and is Art Deco inspired. 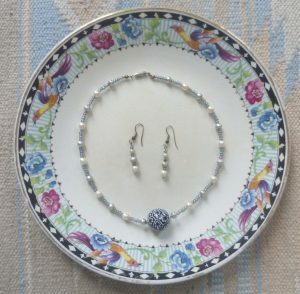 The bracelet is made from jet beads, matched as evenly as I can, and spaced with pearl beads. I’m rather pleased with my black flower earrings with the small pearl stamens – I was inspired by my fuchsia. I have a number of jet flowers, but many have broken, so I was thrilled to find two which were the right size and undamaged. I’m very careful with the flower earrings. If one of them breaks, then that’s it. 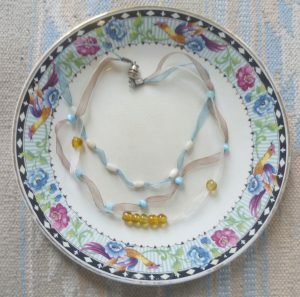 I made the above because beads on ribbon necklaces became fashionable, and I wanted to see if I could make one – fixing the three ribbons to the clasp was very fiddly. Unfortunately, I didn’t realize that the amber coloured beads had larger holes than the other beads and the ribbon didn’t hold them in place as well. So this is what happened…. I’m not sure what to do about it. The last thing I want to do is to open the clasp which holds the three ribbons in place. Any suggestions would be gratefully received! What I particularly like about making my own jewellery is that I can have exactly what I want. I can make a necklace or earrings to go with a particular dress or shirt. And, if I don’t like it, I can take it apart and try again. And, if I lose an earring I’ve made, I can always make myself another one – unless it’s jet, of course. These are beautiful. I have always loved making things – my heroines do quite a bit of it in various ways. Very soothing to the soul to have a finished object. I suppose you couldn’t thread extra pieces of ribbon through the amber beads to pack the hole and then snip them at each side of the beads? Thank you for your comment, Jan, and for your useful suggestion. It sounds like a distinct possibility – I shall think about it. And you are right about it being good for you. It’s something to do with the combination of intense concentration and hand eye coordination. It’s like an intense work out whilst sitting down! 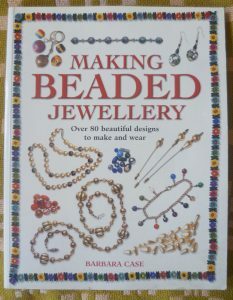 Thirty five years ago I was regular customer at The Bead Shop in Covent Garden, but unfortunately I wasn’t as creative as you are, so my efforts were sadly less effective. Thank you for evoking happy memories. Thank you, Prem. The Bead Shop was wonderful, wasn’t it? I loved the way it sold all sorts of beads: semi-precious, glass and plastic. It wasn’t a snobbish shop! I haven’t been for some years, so I’m not sure it’s still there. So admire you for doing these! I’ve never had patience for fiddly stuff like this. Everything has to be fast and simple for me if I’m going to do any handcrafting at all. But I can see the advantages in the DIY thing. I bought some lovely little white beads in Paris at the flea market and have never used them. Perhaps I’ll pass them on to you. Likely still sitting my my sewing basket that rarely gets opened unless I have to sew on a button! all power to your beading elbow. Your comment made me smile, Elizabeth. I had a tiny hole in the sleeve of a cotton cardigan which sat in my sitting-room for about three months before I got round to repairing it – a job which took all of three minutes!